It’s assumed that dogs hate cats. However, one little dog named Ginny proved that some actually love them. 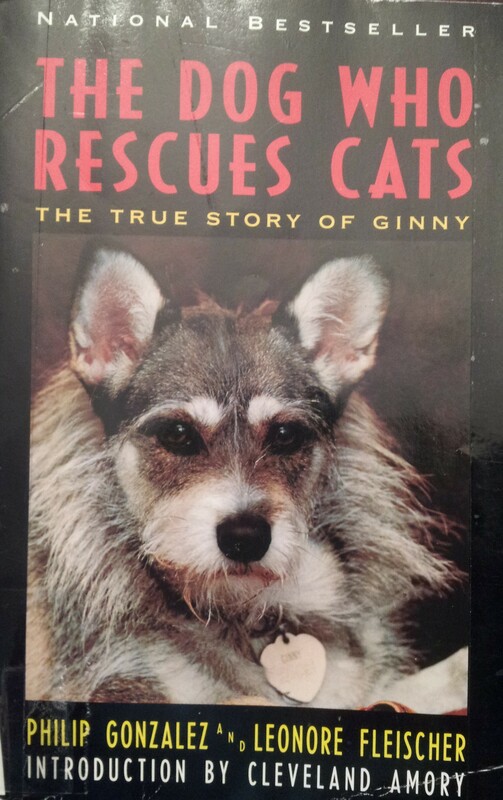 In this book, her owner Philip Gonzalez relates the story of Ginny and her remarkable ability to find injured cats and rescue them. 1. It was such a sweet story about how Ginny first helped Mr. Gonzalez recover from depression and then started helping the stray cats. 2. I’m a cat lover, so it was really cool to see how Mr. Gonzalez and his friend, Sheilah Harris, eventually came around to loving cats. 3. My favorite story was Topsy’s rescue. Ginny found this brain damaged cat at a construction site. The poor thing could only roll where she wanted to go, but Ginny and Mr. Gonzalez took her in anyway. 4. Ginny was absolutely adorable. She was part schnauzer and part Siberian husky. 5. Mr. Gonzalez came up with some great cat names – Solomon, Calliope, Revlon, Vogue, and Van Gogh were some of my favorites. 1. The beginning was a bit slow. 3. The book was written in 1995, and I wanted to see what had happened to Ginny since then. Sadly, she died in 2005.